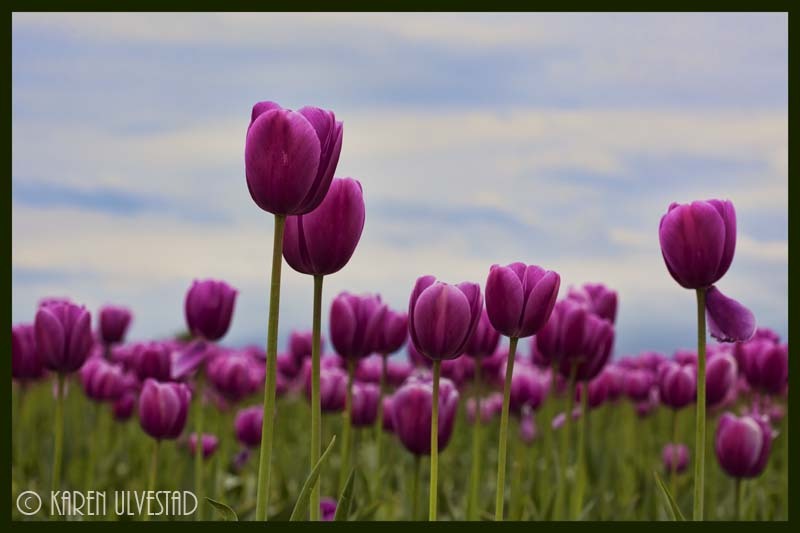 This photograph was taken in the tulip fields during the Skagit Valley Tulip Festival. There were hundreds of people in the fields on this day. Event provide a great opportunity to photograph nature, though they can be very crowded with people. There are a few techniques that can be used to create the photograph that shows the elements the photographer wants his/her view to enjoy. First, it is important to control the aperture or depth of field (DOF). Many times, a person in the background can disappear with a shallower depth of field. They become another shape or color without definition. 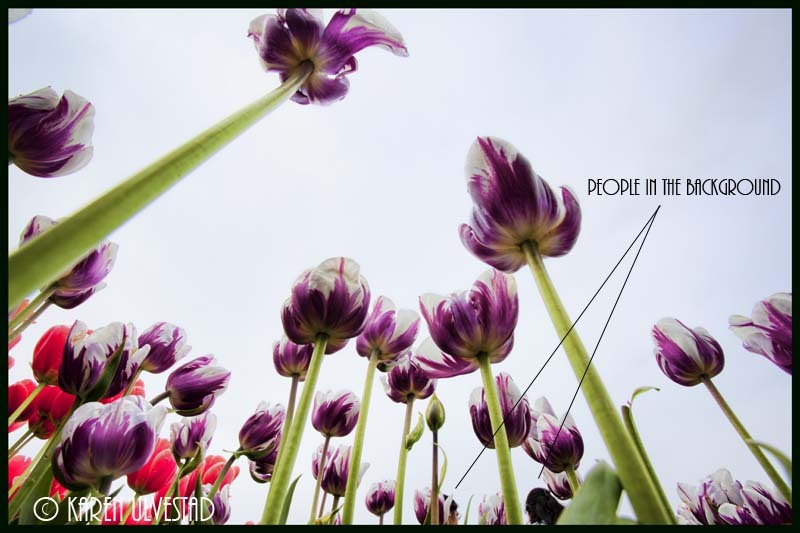 In the photo above, the DOF is shallow enough to blur the tulips in the background. This is one of my favorite photographs of the tulips that I took on this shoot. Unfortunately, there are people in the background. To use this for retail, I would need to get a model release from the people, or remove them from the image. Second, take the time to look at all the elements in the photograph. In the picture above, I missed the two women at the bottom of the picture. During the event, people were suppose to stay out of the field, but everyone wanted their picture taken with the tulips. In this instance, I should have waited until they left the field. Third, selectively crop the photograph before taking the picture. At a crowded venue, it is important to take time to visualize the photographic image before taking the picture. This is where the elements of composition can help the photographer select what goes into the photo. This concept is shown in the image below. Selective cropping of the photograph in the camera can eliminate people from the photograph. Fourth, it is important to consider your perspective of the scene or point of view. Often times, the chosen perspective can naturally crop-out unwanted elements from a photograph. In the top image, the perspective eliminates the people and buildings from the photograph. 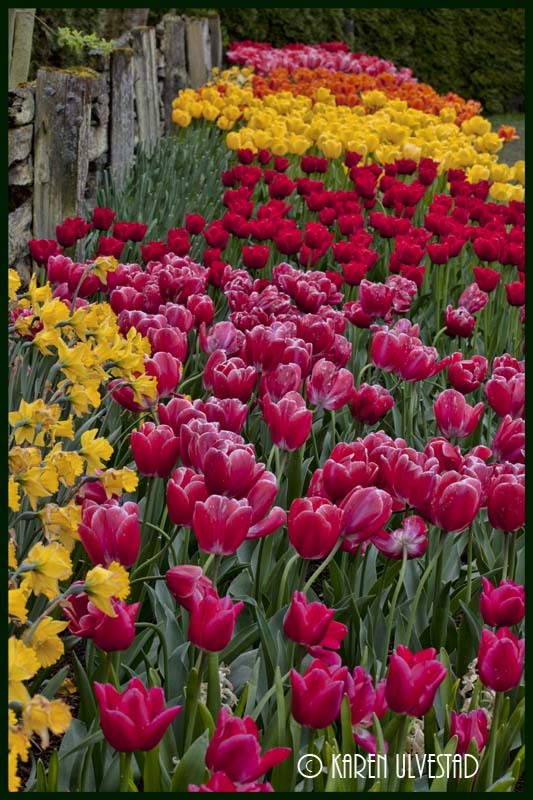 In the third image, the perspective includes all of the different colors of tulips in the garden, while eliminating people, structures and the road from the photograph. Also, it is important to experiment when composing a photograph in a crowded area. ← Catching a Defining Moment. . .